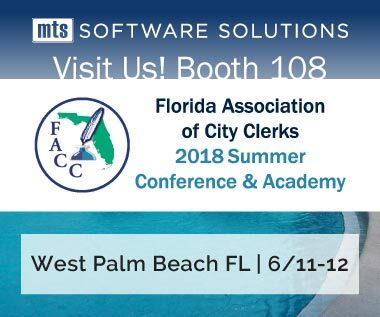 Join the MTS Software Solutions team at PGA National Resort and Spa for the FACC 2018 Summer Conference and Academy. Connect and collaborate with leading records management experts, vendors and customers. Discover emerging technologies to develop the solutions you need to thrive in today's ever-changing municipal clerk's offices. We invite you to stop by our booth #108.